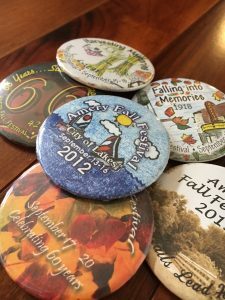 The Amery Fall Festival’s heritage has been pivotal in the Amery, Wisconsin community for the celebration of the Fall Season! We will be celebrating the 69th annual festival in 2018! Our festival features a grand parade, live music, a large selection of food and entertainment, arts & crafts, beer garden, and so much more! Buttons have been produced for the festival since 1949. Come to the Amery City Hall (Amery City Council Chambers) to see the entire collection!